Jerry John Rawlings (born 22 June 1947)  is a former Ghanaian military leader and politician who ruled the country from 1981 to 2001 and also for a brief period in 1979. He led a military junta until 1992 and then served two terms as the democratically elected President of Ghana. A military junta is a government led by a committee of military leaders. The term junta comes from Spanish and Portuguese and means committee, specifically a board of directors. Sometimes it becomes a military dictatorship, though the terms are not synonymous. Rawlings initially came to power in Ghana as a flight lieutenant of the Ghana Air Force following a coup d'état in 1979 and, after initially handing power over to a civilian government, took back control of the country on 31 December 1981 as the Chairman of the Provisional National Defence Council. In 1992, Rawlings resigned from the military, founded the National Democratic Congress, and became the first President of the Fourth Republic. He was re-elected in 1996 for four more years. After two terms in office, the limit according to the Ghanaian Constitution, Rawlings endorsed his vice-president John Atta Mills as presidential candidate in 2000. He currently serves as the African Union envoy to Somalia. Flight Lieutenant is a junior commissioned air force rank that originated in the Royal Naval Air Service and is still used in the Royal Air Force and many other countries, especially in the Commonwealth. It is also sometimes used as the English translation of an equivalent rank in non-English-speaking countries, especially those with an air force-specific rank structure. Castle Douglas is a town in Dumfries and Galloway, Scotland. It lies in the lieutenancy area of Kirkcudbrightshire, in the eastern part of Galloway, between the towns of Dalbeattie and Gatehouse of Fleet. It is in the ecclesiastical parish of Kelton. Kirkcudbrightshire, or the County of Kirkcudbright or the Stewartry of Kirkcudbright, is a historic county, registration county and lieutenancy area in the informal Galloway area of south-western Scotland. For local government purposes, it forms part of the wider Dumfries and Galloway council area of which it forms a committee area under the name of the Stewartry. 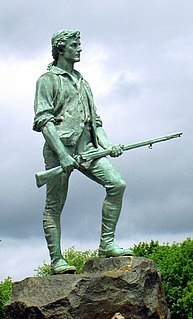 A militia is generally an army or some other fighting organization of non-professional soldiers, citizens of a nation, or subjects of a state, who can be called upon for military service during a time of need, as opposed to a professional force of regular, full-time military personnel, or historically, members of a warrior nobility class. Generally unable to hold ground against regular forces, it is common for militias to be used for aiding regular troops by skirmishing, holding fortifications, or irregular warfare, instead of being used in offensive campaigns by themselves. Militia are often limited by local civilian laws to serve only in their home region, and to serve only for a limited time; this further reduces their use in long military campaigns. Hilla Limann was the President of Ghana from 24 September 1979 to 31 December 1981. Eventually he became a diplomat, and served in Switzerland. Limann, whose original last name was Babini, was born in the northern Ghanaian town of Gwollu in the Sissala West District of the Upper West Region to a poor family. He managed to gain an excellent education, and took up an academic career. The National Convention Party (NCP) is a political party in Ghana that existed between 1992 and January 1996. The National Democratic Congress (NDC) is a social democratic political party in Ghana, founded by Jerry Rawlings, who was Head of State of Ghana from 1981 to 1993 and the President of Ghana from 1993 to 2001. Following the formation of the Provisional National Defence Council (PNDC) which ruled Ghana following the military coup d'état on 31 December 1981, there was pressure from the international community to restore democracy. The NDC was formed as the ruling party ahead of elections in 1992, in which Rawlings was elected president, and in 1996 Rawlings as re-elected as the NDC candidate. Rawlings' second term ended in 2001. The NDC lost the presidency in the 2000 election, and it was not until the 2008 election that they regained it with candidate John Atta Mills. The Provisional National Defence Council (PNDC) was the name of the Ghanaian government after the People's National Party's elected government was overthrown by Jerry Rawlings, the former head of the Armed Forces Revolutionary Council, on 31 December 1981. It remained in power until 7 January 1993. In a statement explaining the coup d'état, Rawlings explained that a "holy war" was necessary due to the PNP's failure to provide effective leadership and the collapse of the national economy and state services. For the rapper with the same birth name, see V.I.C..
Brigadier Joseph Nunoo-Mensah is a Ghanaian soldier and politician. He is a former Chief of Defence Staff of the Ghana Armed Forces. He was also a member of the Provisional National Defence Council government which overthrew the government of Dr. Hilla Limann in 1981. 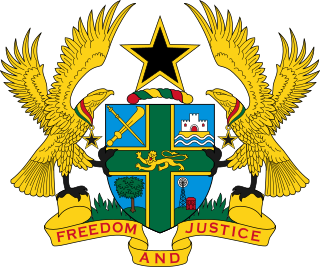 A referendum on a new constitution was held in Ghana on 28 April 1992. The main issues were the reintroduction of multi-party politics and the division of powers between the president and parliament. Major Courage Emmanuel Kobla Quashigah was a Ghanaian soldier and politician. He held many prominent positions in the Ghana Armed Forces and was a Minister of State for Agriculture and later Health in the NPP government of John Kufuor between 2001 and 2009. Enoch Teye Mensah is a politician. He was a Minister for Education and a Member of Parliament in Ghana He is popularly referred to as E. T. Mensah. Kwesi Armah was a Ghanaian politician and diplomat. He was the High Commissioner (Ambassador) to the Court of St. James in London, England, and the Minister of Foreign Trade in the administration of Kwame Nkrumah before the military coup of 1966. He later served in the Council of State in the government of John Kufuor. The National Democratic Party (NDP) is a Ghanaian political party, founded in October 2012 as a split from the ruling National Democratic Congress. Its first leader was former NDC politician Nana Konadu Agyeman Rawlings, who is also the wife of former President of Ghana and NDC founder Jerry Rawlings. ↑ "FLT LT JERRY JOHN RAWLINGS Former President of The Republic of Ghana". Archived from the original on 27 December 2012. Retrieved 3 January 2013. ↑ "Flt.-Lt. (Rtd) Jerry John Rawlings Profile". Archived from the original on 14 February 2013. Retrieved 3 January 2013. 1 2 3 4 5 6 Nugent, Paul (2009). "NKRUMAH AND RAWLINGS: POLITICAL LIVES IN PARALLEL?". Transactions of the Historical Society of Ghana (12): 35–56. JSTOR 41406753. 1 2 3 Morrison, Minion K. C. (2004). "Political Parties in Ghana through Four Republics: A Path to Democratic Consolidation". Comparative Politics. 36 (4): 421–442. doi:10.2307/4150169. JSTOR 4150169. 1 2 "May 15, 1979: Flt. Lt. Jerry Rawlings arrested after failed military uprising". Edward A. Ulzen Memorial Foundation. Retrieved 2018-11-24. ↑ Pike, John. "Ghana - Rawlings Coup". www.globalsecurity.org. Retrieved 2018-11-28. 1 2 Adedeji, John (Summer 2001). "The Legacy of J.J. Rawlings in Ghanaian Politics 1979-2000" (PDF). African Studies Quarterly. 5. 1 2 3 4 5 6 7 8 9 10 11 12 13 14 Abdulai, David (1992). "Rawlings "Wins" Ghana's Presidential Elections: Establishing a New Constitutional Order". Africa Today. 39 (4): 66–71. JSTOR 4186868. 1 2 3 4 "The Politics of Reform in Ghana, 1982–1991". publishing.cdlib.org. Retrieved 2018-11-24. ↑ "The Politics of Reform in Ghana, 1982–1991". publishing.cdlib.org. Retrieved 2018-11-24. ↑ Horton, Richard (2001-12-22). 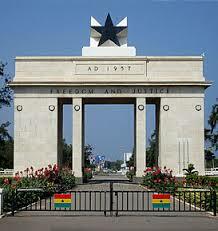 "Ghana: defining the African challenge". The Lancet. 358 (9299): 2141–2149. doi:10.1016/S0140-6736(01)07221-X. ISSN 0140-6736. PMID 11784645. 1 2 3 4 5 6 7 8 9 10 11 12 13 14 15 16 17 18 19 Lyons, Terrence (1997-04-01). "A Major Step Forward". Journal of Democracy. 8 (2): 65–77. doi:10.1353/jod.1997.0019. ISSN 1086-3214. ↑ Adedeji, John (Summer 2001). "The Legacy of J.J. Rawlings in Ghanaian Politics 1979-2000" (PDF). African Studies Quarterly. 5. ↑ "The Electoral Political Process". Devex. 2012-11-30. Retrieved 2018-11-24. ↑ Rawlings named AU envoy to Somalia Archived 2 June 2011 at the Wayback Machine . news24.com. ↑ "Jerry Rawlings: A Threat to Ghana's Democracy?" Archived 7 January 2015 at the Wayback Machine . The African Executive. ↑ University for Development Studies News. "Acceptance Speech by H. E. Jerry John Rawlings" (PDF). Leadership for Sustainable Development and Democratic Transition in Ghana. Archived from the original (PDF) on 29 October 2013. Retrieved 27 October 2013. ↑ Peace FM Online (27 October 2013). "Rawlings Receives Another Award In South Africa And Says The World Is Engulfed In Hypocrisy". Office of Flt. Lt. Jerry John Rawlings/Former President of the Republic of Ghana. Archived from the original on 29 October 2013. Retrieved 27 October 2013.